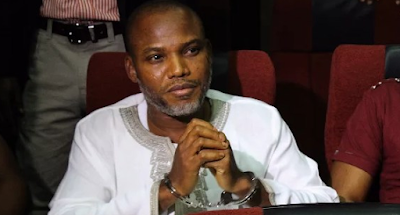 The Igbo socio-cultural group, Ohaneze Ndigbo, and the pro-Biafra group, Indigenous People of Biafra, IPOB have condemned the Federal Government’s moves to re-arrest IPOB leader, Nnamdi Kanu, describing it as the height of hypocrisy. In a statement Saturday, the president of Ohaneze, John Nwodo, warned the Attorney-General of the Federation, Abubakar Malami, to respect his oath of office, and beam his attention on other urgent national matters. “I am amazed that the distinguished attorney is prepared to contest the superiority of the provisions of the Constitution on fundamental human rights of freedom of movement and freedom of association over an erroneous judicial proclamation violating those rights,” Mr Nwodo said. Mr Malami had on Friday demanded the revocation of Mr. Kanu’s bail which was granted the defendant in April. The application which was based on 12 grounds of appeal, followed an allegation by the AGF that Mr. Kanu exhibited flagrant disobedience of court orders on his bail conditions. But Ohaneze said that Nnamdi Kanu, as a citizen of Nigeria, is free to hold any point of view no matter how displeasing to anyone so long as they are not inciting or provoking any criminal activities. He argued that even though some Igbo leaders had differences of opinion with Mr. Kanu on certain matters, that did not mean they would sit back and allow his rights to be trampled on. “We have been insulted and abused by Radio Biafra but we concede them their right to differ from us. We concede them their nature to be exuberant as youth but we cannot be judgmental about their rights. “This is a democracy. In democracies, leaders are abused, pelted with rotten eggs and booed at, as the former Edo State Governor was booed in Abuja a few days ago. These acts are not necessarily criminal,” the Ohaneze said. The media and publicity secretary of IPOB, Emma Powerful, while reacting to call said the government must also approach the courts to grant its prayers and not try to subvert the legal process by arresting without the permission of the court. “We wish to place the whole world on notice regarding the illegal and wholesome undemocratic moves by Government to re-arrest our leader Mazi Nnamdi Kanu who committed no crime known to the laws of the Nigerian state. This dangerous path of intimidation, smacks of state sponsored terrorism designed to silence free speech and infringe on our rights to peaceful assembly”. He said Mr Kanu was prepared for a long drawn battle with the Federal Government.